This is a scrumptious summer salad which uses two of the crops we’ve got growing in abundance at the moment: perpetual spinach and strawberries. Perpetual spinach or spinach beet, is not really spinach at all, but it looks like spinach, tastes like spinach, is incredibly hardy and produces an all year round supply, so is far less hassle than true spinach which is more high maintenance and has a tendency to bolt. It is a wonderfully prolific cut-and-come-again crop with leaves that can be eaten raw or cooked. By all means use true spinach in this recipe if that’s what you’ve got to hand, but if you have a vigorous crop of perpetual spinach growing in your garden or allotment along with your strawberries right now, this is a great way to combine them. 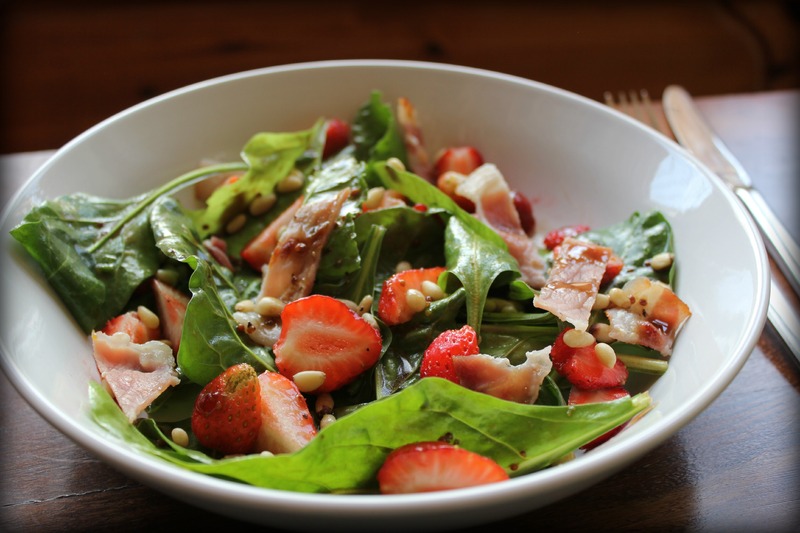 The balsamic and honey dressing intensifies the sweetness of the strawberries, which are beautifully off-set by the salty bacon, and the toasted pine nuts add a hearty crunch. Dry fry the pine nuts in a pan for a couple of minutes, tossing them regularly. Remove from the pan. In the same pan, fry the rasher of bacon for a few minutes, turning half-way. There’s no need to add any oil if you keep the heat moderate. Remove bacon onto a plate lined with kitchen towel and allow to cool. Add any juices from the pan into your dressing and mix well. 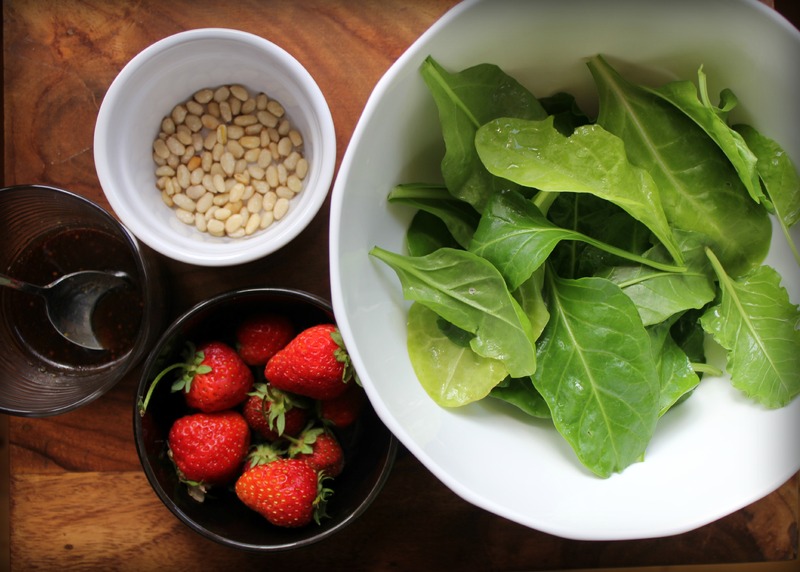 Add the washed spinach leaves to a bowl along with the chopped spring onions, strawberries and pine nuts. Chop the bacon rasher into small pieces and add to the bowl. Drizzle over the dressing, mix well and serve. I’ll have to look into Perpetual Spinach. My regular spinach always bolts and I end up losing most of it. Do give it a go. Perpetual spinach is far more forgiving than regular spinach. And it tastes just as good! Yummy, yummy! What an off-the-wall combination, but I can’t wait to try it.